Increasing numbers of clinicians and lab owners who have made the leap to digital orthotic technology are seeing meaningful returns on those investments in terms of increased convenience, flexibility, and—importantly—profitability. 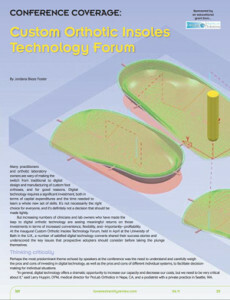 At the inaugural Custom Orthotic Insoles Technology Forum, held in April at the University of Bath in the U.K., a number of satisfied digital technology converts shared their success stories and underscored the key issues that prospective adopters should consider before taking the plunge themselves. Perhaps the most predominant theme echoed by speakers at the conference was the need to understand and carefully weigh the pros and cons of investing in digital technology, as well as the pros and cons of different individual systems, to facilitate decision-making for individual situations. Machining orthoses with desktop cryogenics, or using an open-source “3D printer” that not only replicates orthoses but can also replicate itself, may seem unattainably futuristic. But these technologies are on the verge of being ready for prime time, and attendees at the Custom Orthotic Insoles Technology Forum got a sneak peak.